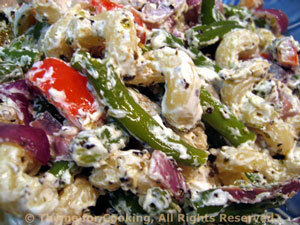 Pasta, Green Beans, Red Peppers, Goat Cheese, Thyme for Cooking summer sides. Bring a large pot of water to a full boil over high heat. Add pasta. Top and tail beans and cut into 1 inch lengths. When pasta is within 4 minutes of being done, add beans. Slice red pepper and onion. Heat oil in a medium nonstick skillet, add pepper, onion and sauté until crisp-tender. When done, put into a large bowl. When pasta and beans are done, drain and add to bowl. Add thyme, chevre and stir until well combined. Serve.